Chicken Drumsticks include the lower portion of the leg quarter. 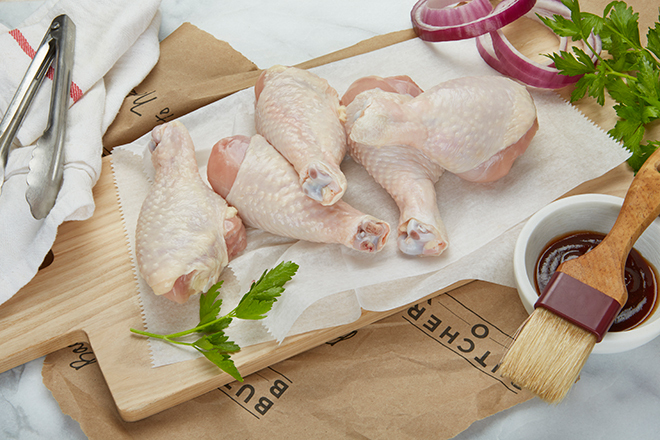 This cut of flavorful dark meat is a favorite for kids and adults alike – use your ButcherBox Drumsticks for a mouthwatering family BBQ or bake them in the oven with an easy, fragrant mix of tandoori spices and some lemony yogurt. 1. Preheat grill. If using open flame, wait for flames to die down. Right before grilling, make sure grill surface is extremely hot, then rub it down with an oil-soaked rag. We advise using tongs to hold the rolled-up rag. 2. Place Chicken Drumsticks at 45° angle across hottest part of grill grates, and grill both sides for 6 min per side, while rotating 90° every 3 min. Keep your meat moving to ensure that it cooks evenly. 3. Move chicken to cooler part of grill, and grill both sides for 25 min per side, while rotating 90° every 5 min. Remove from grill when meat thermometer inserted into thickest part reads 165°F. 2. Add oil. Once oil is hot, sear Chicken Drumsticks for 4 min, or until golden-brown and crisp. Flip and sear for 2 min. Remove and set aside. 6. Finish the chicken on the stove top at the same low simmer, or in a 300°F preheated oven. Cook for 1½ hrs, or until meat thermometer inserted into thickest part (without touching bone) reads 165°F.